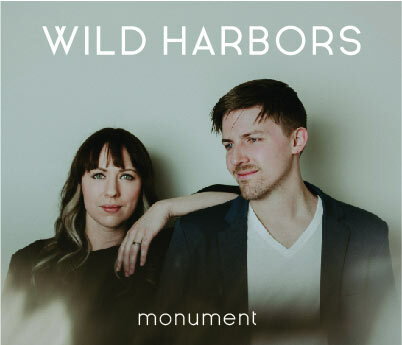 Maryland-based husband/wife duo Wild Harbors are set to bow their highly anticipated full-length debut, Monument, March 15. Produced by Andrew Osenga (Laura Story, Caedmon’s Call), the alt-pop singer/songwriter collection features 10 story-driven tracks wrapped in memorable melodies and warm harmonies. Monument is highlighted by the title-cut, a deeply personal anthem for Wild Harbors’ Chris and Jenna Badeker, reminding them of God’s guiding hand in every step of their journey. The project also features two poignant selections addressing marriage—the passionate “House On Fire” grapples with Chris’ perspective on relational tensions, while “Alone Together” explores Jenna’s fear of isolation. A showcase of the couple’s storytelling style, “Ballad of Wallace and Jessie” was inspired by a musician aboard the Titanic who played his violin on the ship’s deck as passengers boarded lifeboats. “He realized he could use his talent in that moment, at great cost to himself, to get people through this tragedy,” Chris shares of the man’s sacrifice. Chris and Jenna Badeker began making music together at McDaniel College in Westminster, Maryland, and have since released two EPs—Monument Part One and Monument Part Two—as Wild Harbors. Their songs “Abigail” and “House On Fire” were among UTR Media’s top tracks of 2018, and the duo’s music has been featured on various Spotify playlists, including Indie Spirit, Faith Finds and New Music Friday. For further information, visit wildharbors.com or turningpointpr.com. Follow the duo on Facebook and Instagram.